This entry was posted on June 29, 2015, in Kundell Communications, Public Relations and tagged Do I need PR?, Kundell Communications, Public Relations, Why PR. Bookmark the permalink. I’ve been hearing that phrase lately as companies seek to consolidate costs by embracing one-source solutions. Management companies, branding agencies, ad agencies, and more have integrated public relations into their services, offering businesses one-source communications solutions. Other businesses turn to their internal staff, instead, as a cost-cutting measure. In either of these cases, the PR may become a function of the sales or marketing department. Unless there is a dedicated P.R. pro on staff, this can be a penny-wise and pound-foolish mistake. The sales or marketing staff may not recognize the difference between creating promotional material versus crafting real, newsworthy angles and content that grabs the media’s attention. While these options may sound enticing, can these integrated services really take the place of a dedicated P.R. practitioner or agency? The answer is yes and no, depending on the organization’s communications goals. For companies and organizations seeking a very basic complement to their marketing, the one-step solution may offer simplicity, savings, and seamlessness. Here the need may be merely churning out a press release about a product or company appointment and answering an occasional media query. How in-depth is the knowledge of the PR staff? What is their background in the chosen industry? How strong are their media contacts? Can they work with your organization’s spokespeople to develop messaging and talking points? How strong are their writing skills? How much time will the agency devote to working on your account and with media? A dedicated PR agency or consultant can work together with marketing to develop a strategy that will drive results and help develop trust on the part of important stakeholders. The ideal agency or consultant will be well established, with carefully honed skills and a list of media contacts they have cultivated over time. 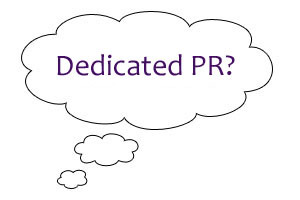 So, while a one-source solution may be fine for simple communications needs, there is no substitute for the expertise and quality provided by a dedicated public relations practitioner or agency.